#15. 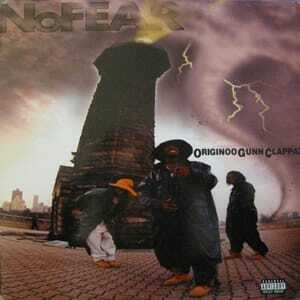 Originoo Gunn Clappaz "No Fear"
Though the track is a near-perfect combination of dingy Beatminerz thump and lyrical moves to turn wack rappers' days into nightmares, the Originoo Gun Clappaz lead single is probably best remembered for its video, in which a Coogi-clad Biggie imitator was mocked mercilessly. There were rumors that Starang Wondah had a physical altercation with Sheek Louch over the slight, which Starang later seems to reference saying, "(Like how up in D&D) I caught two or three stitches" on "I Ain't Havin' That." Big never explicitly responded to the shot on record, but surely a few of the many subliminals on Life After Death were aimed in their direction. He really should have taken the opportunity to call out their Gorton's Fisherman-chic choice of rain attire. In all fairness, though, the trio was preparing for Da Storm.